As a Managed Service Provider you constantly have to look at how you differentiate your capability from ever-increasing competition and how you retain your clients as they evolve and their requirements change. Through working with MSPs we understand the challenges you face and have designed a specific portfolio of cloud and connectivity services all wrapped in a value-adding program designed to give our partners a distinct business advantage. Your customers are either embracing the cloud now or looking to do so in the near future. Ensuring you are part of this journey is critical and presents an opportunity to increase recurring revenues. 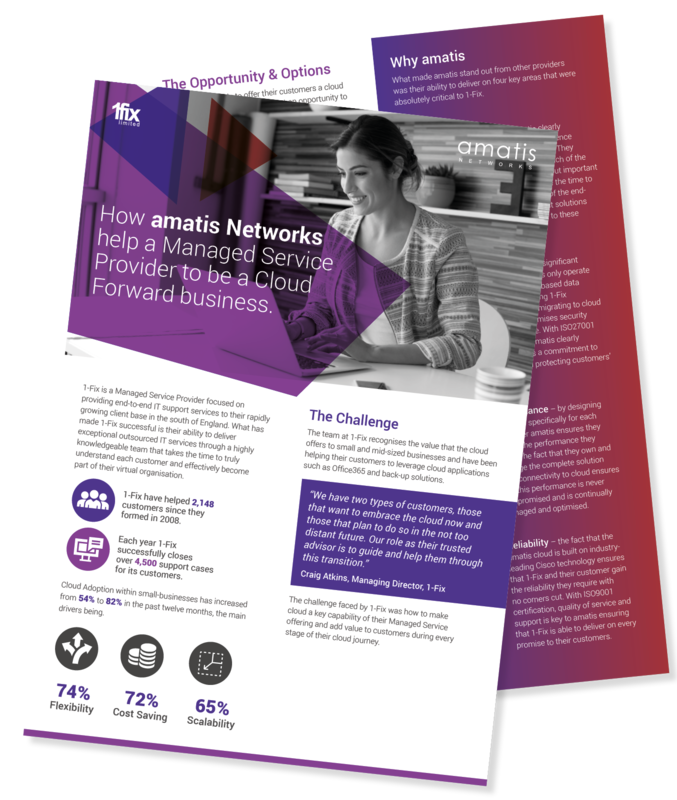 By partnering with amatis you avoid having to invest in your own cloud or reliance on undifferentiated public clouds, you simply utilise our data centres and cloud environments to deliver your own white-labelled cloud services. We offer a broad range of options including colocation, public and private cloud services giving you the flexibility that you clients demand. Your clients rely on connectivity for internet services and/or to link offices, however, the reliability of these services can impact your service delivery and performance against SLAs. We operate are own carrier grade network and provide our MSPs with a broad range of connectivity services they can offer to their clients. This not only improves the resilience of such connectivity but provides our MSP partners with the opportunity to generate incremental margin from such services. You will find amatis refreshingly different. We are not a wholesaler of services that have been trimmed down to protect margins. We aim to be an extension of your organisation, providing that injection of expertise to complement your capabilities. We take time upfront to design the right solution ensuring we get things right first time. We are proactive in monitoring your managed environments, identifying potential issues before they become service affecting, and provide a responsive 24×7 service that connects our MSP partner directly with our experts. When looking to offer your clients cloud and connectivity services, you need to work with a partner that does not treat you like just another end-user. You need a provider that can add to your value and provide you with an advantage. 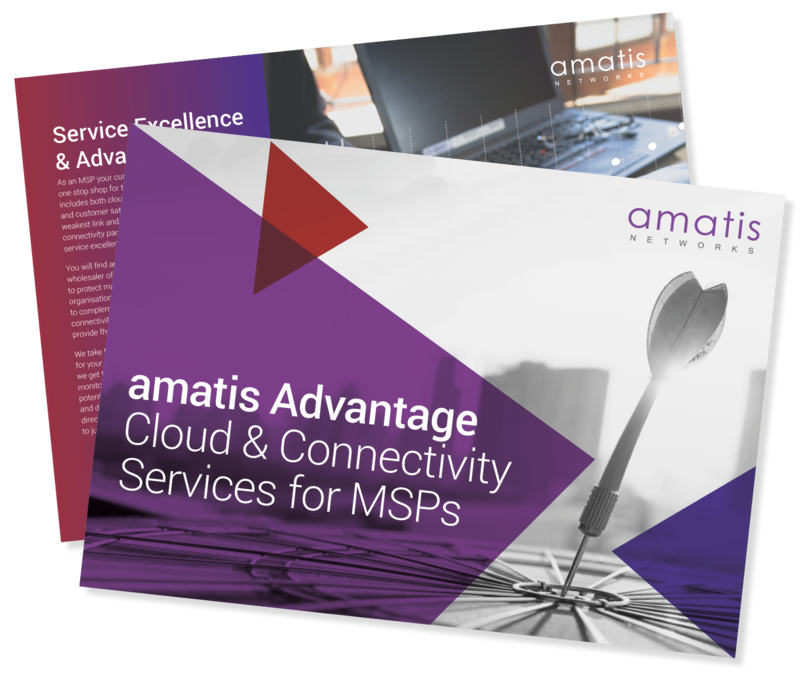 When working with amatis you gain access to our solution specialists that help you design and architect cloud-based solutions for your clients as well as helping you price and configure solutions. We work with you to tailor your services underpinned by our cloud to differentiate you in your market and augment your specific skills with the amatis team. Learn more about our Cloud and Connectivity Services designed specifically to deliver advantage to our MSP partners. 1-Fix is a Managed Service Provider focused on providing end-to-end IT support services to their rapidly growing client base in the south of England. The team at 1-Fix recognises the value that the cloud offers to small and mid-sized businesses and have been helping their customers to leverage cloud applications such as Office365 and back-up solutions. The challenge faced by 1-Fix was how to make cloud a key capability of their Managed Service offering and add value to customers during every stage of their cloud journey.